Tattoos are for life. That means when you’re searching for a tattoo idea, you have to make sure that the design is something you can live with and not regret after. Finding a great design may be tough which is why I’ve dug around on the internet and found these three websites that offer some of the best tattoo ideas plus some other awesome features. With these sites you can browse their large databases of high quality designs, download the designs and take them to your tattoo artists. You can even get recommendations on a great studio. Here are 3 sites that offer some of the best tattoo ideas available on the web. 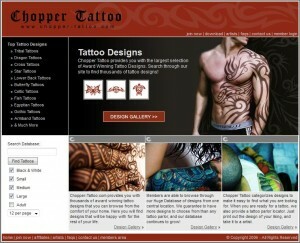 Review: Chopper-Tattoo has a large selection of tattoos in various categories. The site is neat and easy to navigate and tattoos are categorized so it’s easy to find what you’re looking for. Once you’re found your tattoo design, just download and print the tattoo off so you can take it to your tattoo artist. There’s also a neat database of tattoo studio locations so you can find a great tattoo artist near where you live. 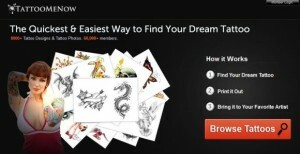 Review: Another great site with over 25,000 tattoo designs. 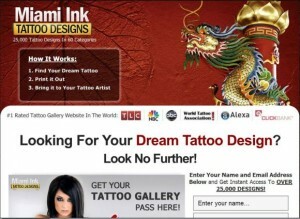 You might have heard about or even seen the reality series Miami Ink on tv. I’m not too sure if this site is owned by the same people or they’re just taking advantage of the name. Nevertheless, it’s a great site if you’re looking for tattoo designs. Just browse through their 61 categories and find your dream tat. Print it off and use the directory to find a tattoo artist near you. Or take it to your favorite tattoo artist so they can get it done. Review: This is by far my favorite of the tattoo design sites. Even though they’re have less tattoo designs than the number 2 pick above, they site has more features and the high resolution quality of the designs are a plus. The designs are drawn by world class tattoo artists who draw exclusively for Tattoo Me Now so you won’t find these designs anywhere else. Another great feature is the community – the forums where you can discuss ink and even show off your tats. It’s a great site for getting inspiration for your next tattoo and finding your dream tattoo design.